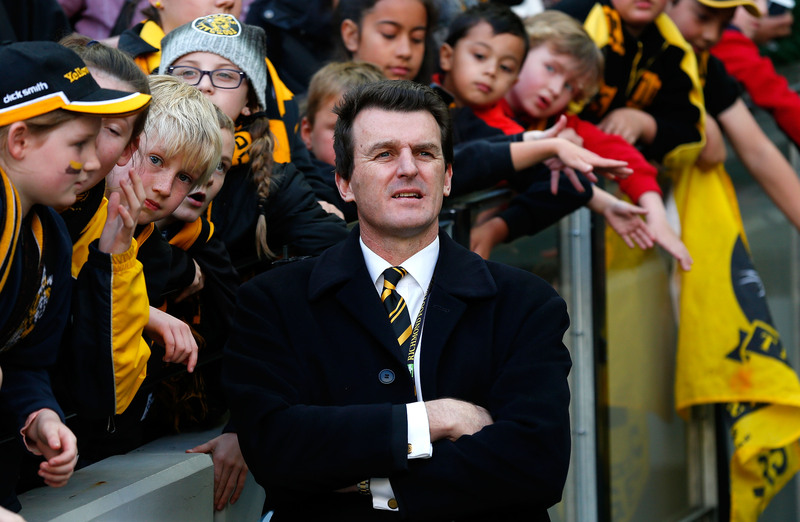 From Jack Dyer in the 1930’s and 1940’s, to Kevin Bartlett during the 1970’s and 1980’s, right up to Matthew Richardson in the modern era, it seems that at some point during their history, every Richmond side has at least one indisputable fan favourite. During the 1990’s the man with that mantle was undoubtedly Brendon ‘Benny’ Gale. The game of Australian football was in Gale’s blood. His grandfather Jack Gale had played three games for Richmond in 1924, while his father Don had been a star performer for more than a decade on the north-west coast in the 1950’s and 1960’s, becoming the first player from the old NWFU to achieve All-Australian honours. Likewise, Brendon’s brother Michael would play nearly 200 games of AFL football for Fitzroy and Richmond. Gale’s pedigree could hardly have been more ideal. His football journey began with Burnie in the NWFU in 1987 as a key forward. At 198cm and 100kgs he was already well developed for the role, and it was obvious to all who saw him play that it was only a matter of time before he would be given an opportunity at VFL level. Indeed, after only one season with the Hawks, the teenager’s talents were sufficiently well-regarded for Richmond to select him with their third round pick – number 27 overall – in the 1987 National Draft, making him the fifth Tasmanian to be selected that year. Ironically, Gale was not the big man in whom the majority of Richmond’s hopes were invested from that draft. The Tigers’ number one selection was South Australian ruckman Richard Lounder, who failed to live up to his billing as a top pick, playing only four games before returning to SA. Gale, however, went on to become one of the finest versatile big men of his era. Gale’s career at Tigerland got off to a rocky start, with persistent injuries and illness preventing him from making his debut for two full years. At last he got his first senior opportunity in the opening match of the 1990 season against the Brisbane Bears at Carrara, where he impressed with ten disposals and two goals. He would go on to play every game in the 1990 season, also making his maiden State of Origin appearance in Tasmania’s famous win against Victoria that year at North Hobart Oval. He followed his successful debut season with another 21 games in 1991, a year in which he solidified his place at centre half forward while making occasional forays into the ruck. At this point he was averaging less than a goal a match, but his mobility and aerial prowess – he had clung onto 218 marks in his first two seasons – continued to impress. It was around this time that the Tigers’ faithful bestowed upon him the nickname ‘Tarzan’, owing to his muscular physique and unruly mop of hair. Gale played 18 games in 1992, but 1993 was the year that he truly began to make his mark on the competition as a goal kicker, booting 26 goals from 16 games including three hauls of four. He continued this success into the next few seasons, booting 91 goals from 67 games from 1994-96 and finishing third in Richmond’s goal kicking each year. This included a career-best return of 34 goals in 1996, a season in which he also recorded his best haul in a match: 6.3 in Richmond’s famous 151-point demolition of Fitzroy at the MCG, the Lions’ final match in Melbourne before their merger. Gale also captained the club in several matches during this period – particularly in 1995 when Tony Free was absent through injury – the highlight of these being Richmond’s stunning semi-final comeback win over Essendon. 1997 saw a significant change in role for Gale. With Greg Dear’s retirement at the end of 1996, Gale assumed the mantle of Richmond’s second choice ruckman behind Justin Charles, and after Charles’ own 16-game suspension the following year, Gale was promoted to first choice ruckman, a position he would hold for the next three seasons. As a ruckman he thrived, and though his scoreboard impact fell as a result, he had arguably become an even more influential player, with his mobility and imposing aerial skills increasing his effectiveness around the ground. This was particularly evident when he would drift into defence, taking goal-saving marks on the last line on more than one occasion. At the turn of the millennium Gale handed over the mantle of number one ruck to young star Brad Ottens. He was still a vital member of the Richmond side in his own right, however, maintaining a high standard of play into the twilight of his career, his value as a wise and experienced mentor only increasing his standing in the club. He played 81 of a possible 91 games between 1998 and 2001, including 22 in his final season. Even in his penultimate match he gathered 14 disposals and 22 hit-outs to comprehensively win the ruck duel against Carlton’s Matthew Allan, helping his side to a famous semi-final win over the Blues. He bowed out of AFL football the following week, in a preliminary final defeat at the hands of the premiership-bound Brisbane side. Despite having a career so blighted by injuries in its early stages, Gale managed to remain extraordinarily physically resilient throughout his entire 12 years in the AFL. In all he played 244 of a possible 268 games after his debut, failing to play 20 games in a season only four times and never playing less than 16. Since the conclusion of his playing career Gale has maintained a high-profile presence in the game he loves so much. Foreshadowing his post-playing career, Gale was appointed president of the AFL Players Association in 2000 during his penultimate season as a player and held the role until 2003, after which he commenced a five-year stint as CEO. This was followed by appointment as Richmond Football Club CEO in August 2009, a position he has held with distinction for nearly six years. He has also given back to the game in his home state, serving for several years as a director on the AFL Tasmania board from 2007 until the board’s dissolution in 2014, and retains a role as an unofficial advisor to AFL Tasmania.